Treatment of symptoms of GERD or gastroesophageal reflux disease such as acid regurgitation, heartburn, and indigestion. 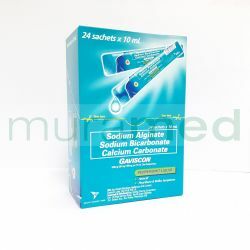 Sodium alginate 500 mg, sodium bicarbonate 267 mg, calcium carbonate 160 mg. ADULTS & CHILDREN above 12 yrs. old: Take 10-20 mL after meals and at bedtime. 6-12 yrs old: Give 5-10 mL after meals and at bedtime. Caution use in patients with hypercalcemia, kidney disease, those on highly restricted salt diet, or are taking other medications. Pregnant and lactating women should consult the doctor first before using this product or any medication. Constipation, gas, and burping may occur.